The selection of Yale professor and poet Elizabeth Alexander to write and deliver a poem at the inauguration of Barack Obama marks not only the return of poetry to a place of prominence in presidential history (she is only the fourth to read at a presidential swearing-in), but represents a true mind-meld between the president-elect and his chosen bard. Professor Alexander is a virtuosic writer and a shrewd analyst of American letters, a polyglot who moves fluently from essay to sonnet, from free verse to drama—and in her teaching, traces equally diverse themes. As the big day approaches, it’s hard to tell who will serve as muse to whom—Alexander and Obama share ties to Chicago and to the classroom, and a demonstrated commitment to the power of words and of community institutions. I recently caught up with my former teacher to discuss her work and the now-finished poem she will deliver at Tuesday’s ceremony. The Root: Congratulations! How were you chosen for the honor? Who called who? 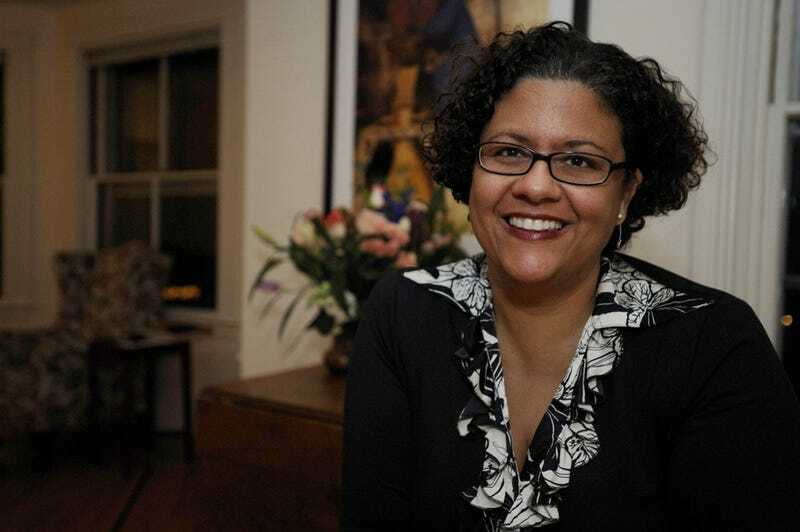 Elizabeth Alexander: I actually don’t know! You’d have to ask the inaugural committee what happened. I just got a phone call saying that they were asking me to write a poem and deliver it. It was a tremendous thrill. Kind of like Sarah Palin, I didn’t even think about saying no. I think one of the really exciting things about the Obama campaign and his election is that so many more people than in the past have felt called to serve, have felt that they needed to step up their game, do what they could. You know, not much has been asked of us in the last eight years—now is the time. So I thought that this question was a continuation of the same mission we heard expressed on the campaign trail. EA: Well, most 19-year old poetry is pretty bad! As to what poetry he favors now, that’s a question better left for him. I do know that when he was photographed a few days after the election, he was holding a copy of Derek Walcott’s collected poems. And let me tell you, an audible collective whoop rose up from the poetry world. It was so wonderful to see that three days after he was elected leader of the free world that he would literally model for us a book of poetry, show the value of taking a moment to see what wisdom could be found in a poem. And with a great poet like Walcott, who, of course, doesn’t shy away from politics and serious sociological thinking. TR: Who have you been reading for inspiration, and how is that different from what you teach at Yale? EA: I did a lot of rereading—and then I stopped. Because it was important that I remind myself what it was possible to do in poetry, but at the same time to create a space to listen to what I had to say. I have learned that the greats inspire, but they can also daunt. So to know when to put them aside is a key calibration. I certainly returned to Walt Whitman, thinking of his lines about “I hear America singing; the varied carols I hear,” and that vision of a multivocal, loud America, speaking in many different voices and different registers. Conveying a sense of expansiveness in America was important to me. And Gwendolyn Brooks, as usual, provides me with her intensity, her fierce intensity of language, the way that she begins simply with the lives she might see outside her window on the South Side of Chicago. I thought particularly about Brooks because, were she living she would absolutely be the one giving the inaugural poem. She’s the bard of the South Side and one of the unheralded geniuses of the last century. And I’ve been thinking, of course, about her connection to Obama’s stomping grounds and what it means to be from Chicago, but also her sense of occasion—her sense of what it means to be a community and to hear it all in the tiniest things. Also, I thought a lot about the poet Robert Hayden, and poems of his such as “American Journal,” where he meditates on “this variegated people” and a poem like “Frederick Douglass,” when he tries to define freedom, to define this concept that we all know, we say we want it—but what is it? And Frederick Douglass is in the poem and tries to make sense of freedom. Those are actually all poets that I teach—at one point or another I try to make it a point to teach what I love. TR: Isn’t this a lot of pressure? And yet a formal reading—at its worst—is one-sided. How will you make your recitation seem like a conversation; how will you evoke that grand American tradition of call and response? EA: I don’t think of poetry as being quite so didactic, of telling people in that way. I think of it as more of an offering, and there is a call and response in that. And part of it is that I’ll have an audience that is so large and dispersed that I won’t even know it—most of the people who will be watching will be watching it on TV—but that call and response will be implicit. One of the things I have learned in 20 years of writing and reading poetry all over the world is that poetry lands, poetry reaches people. You don’t always know in that particular moment who and where your audience is, but it has a brilliant way of finding the people that need it and so I hope that this will. TR: You’ve said that Obama holds “not a strictly nationalist view of where art is to be found.” Your work and teaching certainly share this assessment—and yet nothing could be more nationalist than an inaugural. How will you incorporate the melting pot into a poem for such an occasion? EA: I think there are two ways of answering that: One of them is to say that what is universal, beyond the national, is always, always local. You speak from right exactly where you are, and you hope that if you find the right words that they can radiate out infinitely. You can’t know where it will stop. Also, we are not isolates on the planet. I think when someone speaks out of America and out of Americanness that is something about being human, connected to all of the other human beings around the world. That’s how I understand nationalism. I am very American; I think there are ways of being quintessentially American. But my life and our lives do not exist in isolation from lives at large. EA: There is a poem of mine that is in Antebellum Dream Book and it opens the book, and it has a section called 1968, and it describes being in Washington as a child in the immediate aftermath of the King assassination. So that reflects my feelings in poetry. But personally, on U Street in particular, I cannot express how much it’s truly shocking—without saying it’s a good shocking or a bad—to see the changes. To see white people on U Street? Shocking, shocking. The city is changing, as cities change. What can I say? TR: You were, as an infant, on the National Mall for Martin Luther King’s 1963 “I Have A Dream” speech. What will it be like to return to the scene of such a foundational myth? Obama glancingly acknowledged the symmetry in his Aug. 28 nomination acceptance speech—will you be more overt? EA: What I love about the obliqueness of Obama, you call it obliqueness, but I saw it more as being a very subtle allusiveness. In Denver, there was that reference at the end where you knew that he could only be speaking of King—but he was not hammering you over the head with it. Because he’s trying to invite as many people as possible into his rhetorical world. He—rhetorically—is a subtle human being; he has a way of letting our complexities lie, not trying to bring them all into a single narrative of unity but rather to understand that we crave analogies because it helps us understand things, but when they’re too heavy-handed it flattens out the truth. So 40 years after that “I Have a Dream” speech, in that same space, it’s clear that one aspect of King’s dream was that all Americans would be able to recognize the full humanity of each other and to say ‘yes, he can.’ But here it is happening on the steps of the Capitol that enslaved black Americans, and as he is moving into a White House that in part was built by enslaved African Americans. And all of those are tremendous and worthy of note, those circles, if you will—but also there’s more to it than that. And I think that’s the way that he presents things to the country: It’s always more complicated than we think—and we can handle it. And I think that’s just great. A chapbook of Alexander’s inaugural poem will be available from Graywolf Press on Inauguration Day. Dayo Olopade is a Washington reporter for The Root.